Lapis Lazuli pigment prints on found Latin Thesaurus paper. KM: … How do you find the phrases in your ‘word’ works? WK: They’re a mixture. The phrases are caught somewhere between reading and looking. It’s where language hovers at the edge of meaning. It is language where, rather than clarifying things, it becomes a series of riddles without a solution. They have enough meaning to crawl into your head, they produce a series of associations. That’s what floats around when you look at the work. With some of the phrases, I could give you a whole paragraph for each phrase, they don’t come from nowhere. Sometimes they are shorthand for a long idea. But it doesn’t matter that that idea is gone. But they’re all different. The block of blue text in the exhibition, firstly they were done because I was given this fantastic lapis lazuli blue paint to work with, I needed a use for the blue paint. Then I was doing a lecture and I thought these could be headlines for different things in the lecture, and then other phrases started coming out of them. Some had a very specific meaning: ‘History on one leg’ was a reference to the toy-toy. But it could refer to all sorts of things. There are some which are very specific which you could expand if you wanted to and give them footnotes, but it’s not really about that. It’s about the way that in reading, one can’t resist trying to predict and trying to create a completion of meaning, and with these, you can’t really reach a completion of meaning. It’s that feeling of wanting to bite at it but it’s not quite there in your mouth. Exposed threads of unfamiliarity and destabilised meanings, which unravel interpretations that may have felt straightforward at first glance. William Kentridge’s latest solo exhibition, That Which We Do Not Remember, shares in the concrete/abstract dichotomy that exists throughout his far-reaching practice. 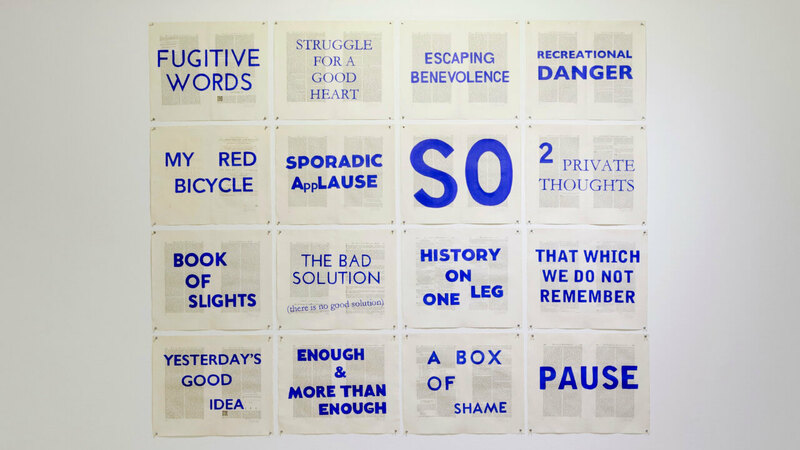 Looking at the series of word paintings entitled Blue Rubrics, one witnesses a back and forth play of words and urges taking turns in appearing deceptively simple and deceptively complex. Ways of seeing and interpreting art are pitted against each other as the viewer is confronted by the familiar and the strange. One can choose to follow the exhibition’s formalistic path, allowing the enigmatic, evocative imagery to flow freely, but they are at risk of losing the satisfaction of a self-discovered punchline, as I did in the case of “History on one leg” and its literal translation, as offered by Kentridge in our conversation. But an attempt to dismantle each work in search of an internal logic would kill the exhibition’s opposing pleasure, striking sensations of immediate, unanalysed truth (or truthiness). This push and pull between context and form nudges the viewer to question what it means to interpret art and the ‘realities’ that inform it. This non-authoritarian method of story-telling and history-telling is refreshing within a climate of myriad grand narratives, particularly because Kentridge’s positionality and recognisable visual language offers leeway to be otherwise. Love Songs from the Last Century, 2017. HD 360 degree virtual reality film. WK: Walter Benjamin wrote that it is time to write history as collage, and then that collage is the preserve of artists. He understood that in fact there is a coherence to be found in fragments, and that coherence is to be found rather than constructed from these fragments. [The exhibition] is history put together in that way. Any easy coherent narrative is at the expense of many other things that have to get pushed aside or left out. KM: It’s a newer kind of historiography. It’s not history as we traditionally know it but it feels more immediate. That’s my feeling when I look at the exhibition. WK: I’m not a historian, so if people are hoping for a good didactic understanding of a particular history, it’s the wrong place to find it. Having said that, there is often a lot of eclectic research around different subjects and sometimes getting quite far into the topic, but never with a sense of my responsibilities to not lead anyone astray. It accepts that there is always a mixture of world and biography meeting. It is those parts of history that echo in me, and what I project on to it. Rather than shying away from their untidiness, Kentridge continues his exploration of history and politics, a theme that can be identified in most of his exhibitions and installations. Kentridge offers his version of the narrative while insisting that the viewer stay aware of its construction. The large-scale series of charcoal drawings of battlefields feel like sketches, lacking the solidity and clarity of line and message that often characterises depictions of war. An alternative to the bronze busts of revolutionary heroes is presented in the form of fragile, maquette-like sculptures of the heads of some of the ANC’s founding members. This alertness to artifice is another refreshing surprise, because this is also an exhibition that makes use of hyperreality, in the form of Virtual Reality headsets. The VR work in question, Love Songs from the Last Century, immerses the viewer within a simulation, and then flattens dimension and exaggerates scale. But the impossible configuration of Kentridge’s virtual world doesn’t make it feel unreal, even if one knows it is not. Stepping downstairs into Goodman’s video room, this feeling is drawn out. Described as a “kinetic model theatre”, the artwork entitled Right into Her Arms is a standout. More blatantly ‘unreal’ than Love Songs from the Last Century, the multimedia work quickened my pulse. I felt actual anxiety on behalf of one canvas in its interactions with another. 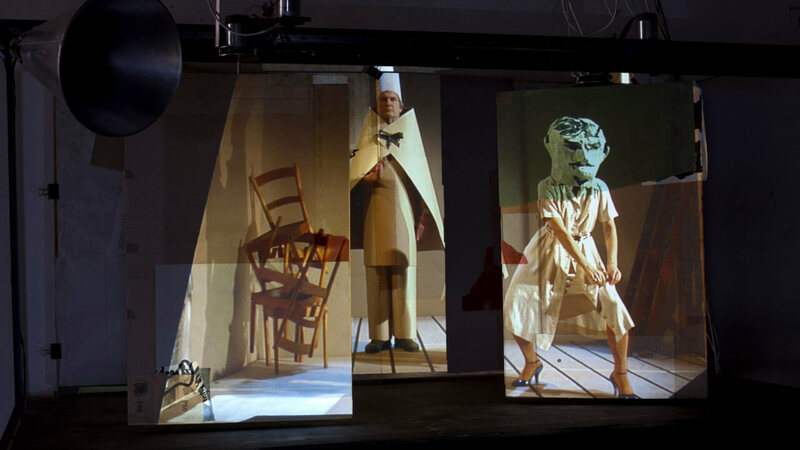 Sourced from Kentridge’s theatrical production of Lulu, originally composed by Alban Berg in Weimar Germany, the piece has an urgency and emotive power far beyond what inanimate objects could be expected to have, unexpectedly rivalling the immediacy and realism of new media and its flat simulation of three dimensions. Right Into Her Arms, 2016. Model theatre with projected HD video, drawings props, software and circuitry, electronic components, wood, steel, cardboard, found paper and found objects. KM: What drew you to Lulu? WK: […] one of the things that it questions is the fragility of the object of desire, the instability of the object of desire. Lulu can never be the woman the men want, and the men can never be the men that Lulu needs. And in operatic terms that always means it ends in death. But what is it that draws people so ineluctably to her? Sometimes it’s her indifference; that she doesn’t care what they think. I think that the sexual politics of it is very interesting and paradoxical and not as obvious as it seems when you first read the synopsis of the script. But it also has to do with finding a medium which enables you to understand the theme. In this case, it was ink drawings. Ink drawings which were made on several sheets of paper which could be arranged or shifted or disintegrated or brought together. In this way, the ink drawing became a demonstration of this instability of who Lulu is. Her face could be shifted, her eyes move further apart, her clothes drop, her whole body could shift and change in this unstable way. The medium of making the piece leads the interpretation of the production. The absurd can be revelatory rather than just comical. 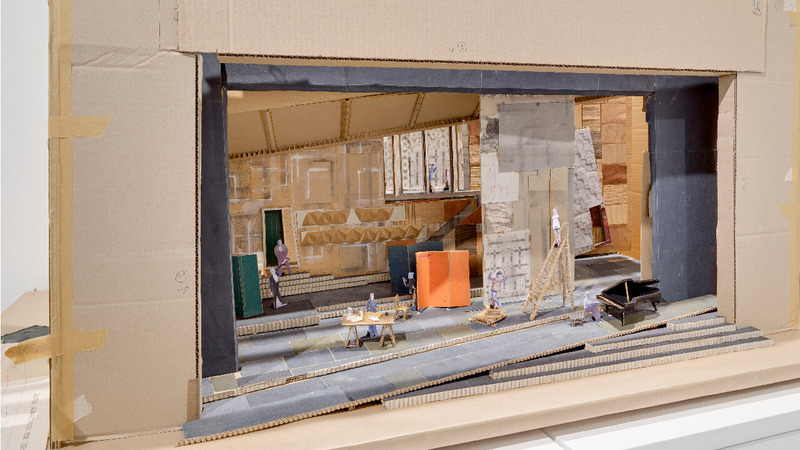 Miniature theater model for Lulu, 2017.